The current ruling party in Turkey – the AKP (Justice and Development Party) are overseeing a regime of paranoia, suspicion, and the harassment of trade unionists. Individuals or groups who dare to dissent are locked up. It is estimated that there are around 6,000 political prisoners currently languishing in Turkish jails. They include 100 journalists, 40 trade unionists, 600 students and academics, and 1,000s of Kurdish activists. Many of the prisoners are in prison for months on end without facing trial. Similar to several other countries – many individuals are arrested and charged with crimes that pertain to anti-terror legislation. A typical example is that of 25 members of Egitim Sen - a teaching trade union who were arrested and subsequently given a six year and five months prison sentence. Their crime was to organise union meetings, and having possession of political books that are found in every book shop across Turkey. Due to a lack of any credible evidence of wrong doing they was going to be acquitted, but at the last minute two of the judges were dismissed from the trial to ensure that the desired verdict was passed. 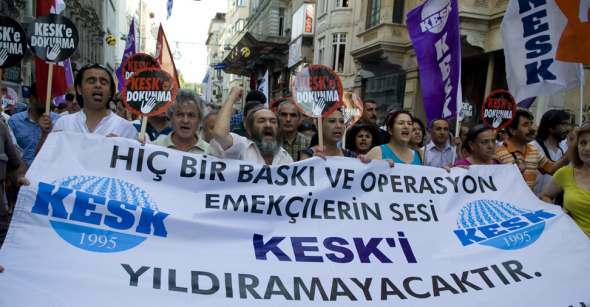 Earlier this year, 71 leaders of the KESK trade union were arrested in a series of dawn raid across 20 Turkish cities. They were ludicrously accused of being part of an illegal terrorist organisation. 28 of those arrested remain in prison, with no evidence of terrorist links, and with no sign of a trial. The Turkish government has recently banned aviation workers from striking, and has no issue with bosses sacking workers who try to organise and unionise their workplaces. An email condemning attacks on trade unionists can be sent to the Turkish Prime Minister’s office via this following link.